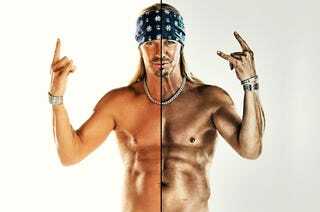 Not long after we suggested that the photo of Bret Michaels on Billboard's cover had been somewhat altered, we received a link to a news story from the folks at the mag. Headline: "Six-Pack Is Real, Says Photographer." Photographer Blair Bunting, who shot Michaels' cover, says he was not shocked by the accusations, but assures skeptics that the Poison singer's chiseled abs are wholly authentic. "When he took off his shirt, I was like, 'This guy's in shape for 47!'" says Bunting, who made his Billboard cover debut with the photo. "It's always easy for someone to cry 'Photoshop,' so I wasn't too surprised by that...but he takes his shape seriously." Everything is exaggerated and smoothed. Wrinkles have vanished. The small indents in Bret's stomach look like deep, dark valleys. Coincidentally, in today's New York Times, one can learn of some alternate ways to get great abs, beyond Photoshop: Lab Series Skincare for Men Ab Rescue Sculpting Gel "tightens, firms and smoothes [sic] the appearance of the midsection with caffeine, creatine and soya protein." Or, you can create shadows with spray tan stuff! Melanie Mills, the lead makeup artist for "Dancing With the Stars" and a spokeswoman for St. Tropez tanning products, said that for faster results, the male dancers on the show, who often perform shirtless, have custom tans to appear more buff… The secret to tanning abs, Ms. Mills said, is "contouring the recesses." And if that doesn't work, try Abs in a Box, which "offers both a defining cream containing caffeine and a makeup palette to both darken contours and lighten the summits of muscles." Because if there's one thing a woman really wants, it's a man with bronzer on his tummy. Jamie Kern Lima, a founder of the company, notes that the makeup is waterproof: "It's not like you're going to get out of the pool and leave your abs [in the water]." I don't know where we (as a society) got the idea that ab definition is so desirable that you need to fake it, but I'll bet anything the market for this crap — and the pressure for men to have killer abs — is no where near the big buisiness of breast implants and Wonder Bras. So… score one for women?